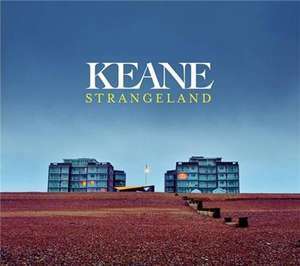 Keane's latest album Strangeland for a special price of £4.99 for the MP3 download version, for 1 week at Amazon. Although I would advise you purchase the deluxe version for only a few pounds more. A must have fresh, uplifiting and distinctive album, maybe even their best yet! It makes a great change from the less inspiring lack lustre music filling up the charts right now. The CD version of the deluxe is - available here. There is also a Hardback Book Edition - available here. I purchased the Hardback Book Edition with an exclusive strictly limited hand numbered screen print and extra exclusive poster, from the official Keane Shop - from here. Any CD order of Strangeland from the official Keane Shop, also comes with a free MP3 download version. The CD version of the deluxe is - available here.There is also a Hardback … The CD version of the deluxe is - available here.There is also a Hardback Book Edition - available here.I purchased the Hardback Book Edition with an exclusive strictly limited hand numbered screen print and extra exclusive poster, from the official Keane Shop - from here.Any CD order of Strangeland from the official Keane Shop, also comes with a free MP3 download version. Any CD order of Strangeland from the official Keane Shop, also comes with … Any CD order of Strangeland from the official Keane Shop, also comes with a free MP3 download version. Standard Keane album £9 everywhere except HMV where it is £10 - doesnt take a rocket scientist to work out why no-one goes there anymore and why there refusal to compete means they're going bust. I never made any reference to it being a "good thing"? You are quite correct there, yes you can rip "all CDs regardless of where you by it", thanks for providing that information to us. Some people may have even learned something from that. I simply included that information because you can have access to the album as soon as it is purchased, while you wait for the physical album to be delivered.